To continue yesterday's story, Khai Yeh's wedding banquet was held at Oriental Pearl Restaurant at Bukit Jalil Golf and country Resort. Uiks? This restaurant is under Tai Thong Group? Very impressive "Choy Tan". I wonder what is Mandarin Fish. Uncle Newton suggested that it's a fish that can speak Mandarin. Alamak! I can't speak Mandarin wor. How ah? 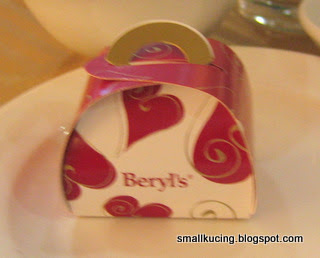 Wow...each got a cute pack of Beryl's chocolate! Two in a pack. Two hearts in one? But how come tinggal one only geh? You wanna know the reason? Coz by the time Mamarazzi took out the camera, I have already done this. And pop it into my mouth. Kejap ada, kejap tarak. My hands have to be very fast leh or else I won't get to eat the chocolate at all.I was having cough at that time. Someone said coughing not allowed to eat chocolate. 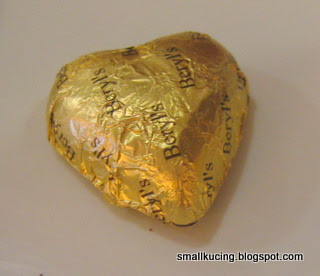 I love this chocolate coz it's not that sweet. 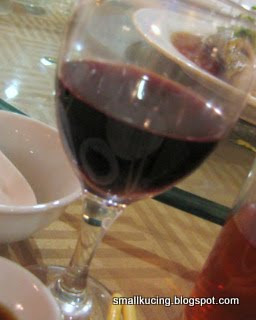 Free flow of Chinese Tea and soft drink.And the waitress kept topping up Mamarazzi's glass with Red Wine. Geee...I hope Mamarazzi won't mabuk and fell on her face like what I nearly did last week. 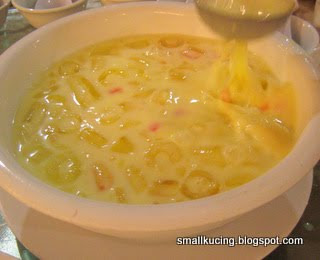 Good thing about this restaurant is thatthe waitress very "seng muk". Without having to be told, they automatically bring a set of baby bowl and cutleries for me. Mamarazzi simply adore the staffs here. Kacang habis liao and they are very happy to refill. And they also give us a lot of serviette. Tra~Ta~Da~Dummmmmm~ The first dish. Five Hot & Cold Combination. Delicious especially the sotong, seaweed and the yellow round thingy. 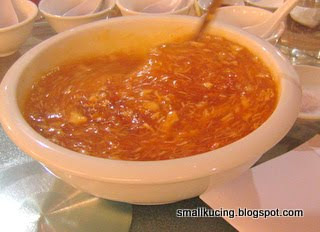 Braised sharkfin soup with Crab Meat and Crab Roe. Can see very large pieces of crab meat in the soup. Alamak..Mamarazzi ter-put kicap instead of vinegar. Thus the soup was a bit too salty. However, the second bowl was yummy! Eee...the dishes comes out so fast geh. Very good. Fried Tiger Prawns with Sweet Corn and Salad Sauce. 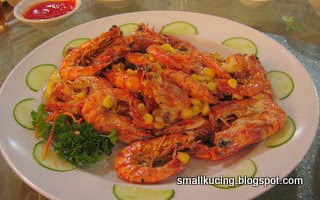 Prawns were very fresh and sweet. Nearly as sweet as my Khai Ma. Kecian Papa. Mamarazzi busy snapping away photos of the happy couple and Papa busy peeling prawns for Mamarazzi so that she don't her fingers dirty. 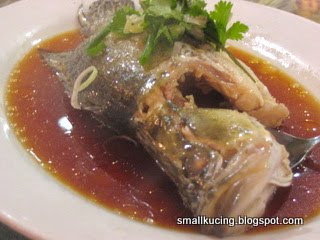 Jeng~jeng~jeng~ This is the Steamed Mandarin Fish. By the time it arrived at the table, it can't speak Mandarin anymore. However, we did had a good meal out of it. 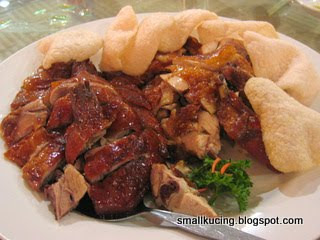 Crispy Roast Chicken and Roast Duck Combination. Aiyo...by the time this tummy was pretty full liao.Mamarazzi thought it's Roast Chicken only but later discovered the Roast Duck. Had a piece though tummy was very full. Aiyo...the duck was real delicious. Papa puji the sweet sauce, plum sauce and don't know what else sauce for the duck and chicken to no end. 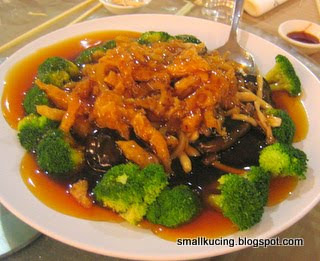 Sauteed Assorted Mushroom with Seafood Treasure & Broccoli. I love the mushroom very much. Mamarazzi bluff me said it's noodle. Thus I ate a lot thinking that it's special type of noodle. Yummy...My favourite. I ate TWO bowls. Very special leh...Got the Lotus Flower Seed leh. 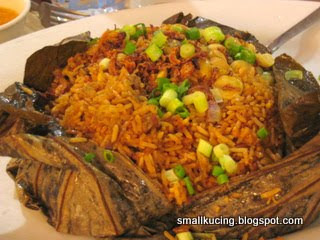 Hmm...hope Khai Yeh and Khai Ma after eat this will "Lin Sang Kwai Ji". 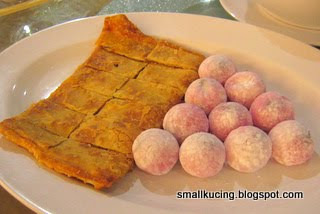 The Crispy Peah and Mochi. Taste average la. But what I love is this.Mixed Fruits Sago. Aiyo...taste a bit like Mango, Honey Dew and something else that I can't recognise. Another TWO bowls of this. Aiyoyo...I don't think I should meet Khai Yeh often. Each time I see him, I sure end up to be stuffed to the max. Happy Honey Moon, Khai Yeh & Khai Ma. Very impressive food presentation out there...em, yummy. 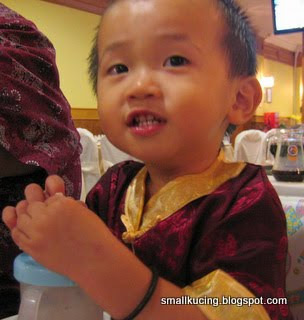 your son is so cute and he is quite independant in serving himself at the dinner. 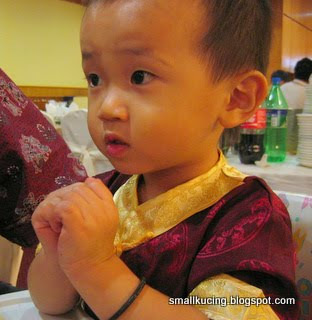 Aiyo...it has been a long time since I go for chinese wedding dinner. I kinda miss it..hehe...I mean the food. Mandarin fish? What a unique name for a fish..haha. Your boy is so quick to wallop the choc..haha..smart little fella. 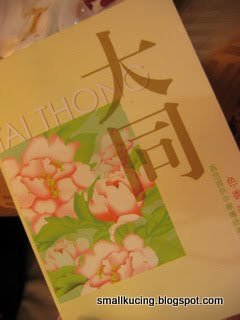 Oooo...Tai Thong! Must be nice! How much per table? Bet it must have cost a bomb!!! yup the food was yummy that day. Uiks? Ya ka? I didnt know it's pork free. My former company also used to held function there too. 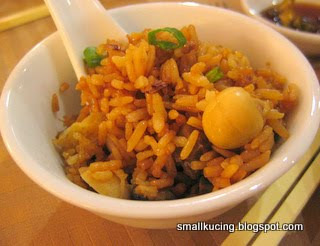 I warned you already that today post is about FOOD FOOD FOOD. Your hubs so good peel prawns for you!! Thumbs up! 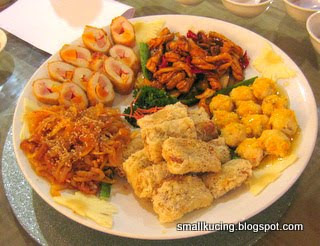 The food looks delicious leh! Me got an award for you! All the food looks very very yummy from the 1st till the last. 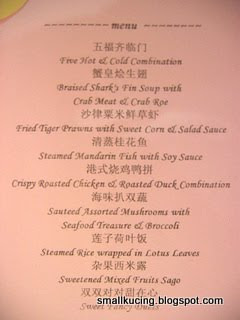 I especially love the chicken and duck and the prawn crackers. 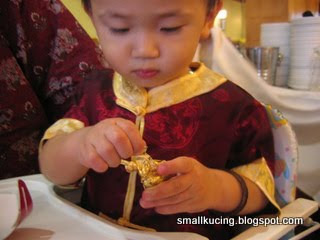 Haha...my cousin did the same as you too-adding soy sauce into the shark fin soup instead of vinegar. The food looks good! Eh...didn't know you went to Bukit Jalil....so near yet so far! Huh awaiting the food pic? slow at downloading ah? Most wedding nowadays are at pork free restaurant to cater for the muslim friends lo. Thus so far, the food here are good la. it depends.If he is sleepy or makan like Hi-tea, then he cant sit still for long. Must run around then come back continue part 2. 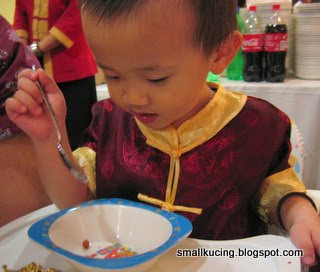 If makan like this with a lot of entertainment...waitress playing with him..the khai yeah singing songs..then got food presentation show..then the yum seng...heis quite okay lo. I was scared he would made a fuss to initially...but lucky though pass his bedtime, he still didnt make a fuss. the steamed rice must be delicious! I have tried the food there once and I will give 1 out of 5...not nice! Hope you are full by now. That is the danger of coming to this blog when you are hungry. I was there last 2 years. Yea, maybe now changed chef already. 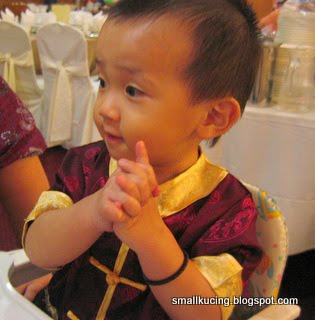 Last time the food not nice ah?